The more observant of you will have noticed that the sticker for this ride bears the moniker Spring Ride 2018... this is because this is the missing ride from last year, when it was a casualty of the ‘Beast from the East’. All the hard work of finding the venue and plotting a route was done by Colin Houliston, and up until about three days before it was due to take place it would have been the first ride of what turned out to be an excellent 2018. Fast forward to this year, and I was lucky enough to bag first ride, so since the stickers had been printed it seemed wasteful not to use them. Early recce revealed that the original route through East Grinstead needed changing as it was tedious and traffic filled. I also changed the positioning of a right turn on to the A24 to give a much-improved sight line. The only ongoing roadworks were a lane reduction on the A3 at the Hook Underpass, but these seem a permanent fixture and avoiding them would have meant a huge (and slow) detour. In deference to JW’s neighbours at 611KR, I set the meeting time at a comfortable 10am with the ceremonial slamming of the gates at 10.30am. Remember, no brief, no ride so if you can’t make it by the time of the briefing you’re not coming out to play with us. It’s also worth reiterating that only Harley and Buell bikes are permitted on an official ride-out, don’t think you can skulk around at the back on your YamaHondaKawa thingy. It was also gratifying that everybody had taken heed of the fact that despite the sunny start it was still flipping cold so much proper riding gear was in evidence. I am a total convert to heated clothing and gloves, as much due to the improved concentration that comes with rider comfort. So, briefing delivered and with the words of the disclaimer ringing in the ears of the 43 participants, off we went. Down the Kings Road, across Putney Bridge, up Putney Hill to Tippetts Corner, down the A3 all the way to the M25 and then off at the Wisley turnoff (thanks to Nigel Gaskin and Rob Warr for marking duties). Through Ripley village and then a left turn took us off into the undergrowth to reappear at West Horsley where we joined the A246 and headed towards Guildford. Left on to the A25 took us up and over Newlands Corner with its new sports-bike induced 40mph speed limit (yawn) and down to Abinger Hammer where we got back off the beaten track. Next landmark was the Parrott at Forest Green but no coffee stop today, we sailed on past. Another left turn after two miles saw us reappear at the A24 where the right turn was accomplished with no fuss and we came across another one of Steve Graham’s photo opportunities. After that there were about 10 miles of faster roads, mostly dual carriageway with big open roundabouts, until we crossed the M23 and negotiated Lingfield. There was then about another 12 miles of country lanes until we arrived in Penshurst after 74 miles and about 2½ hrs. No incidents and no missed drop-offs, for which I am grateful. Hard standing parking had been reserved for us, and, apart from those who had early afternoon appointments, we had lunch either in the courtyard restaurant or the café by the car park. Then it was time to go home; depending on your choice and timing of route there was a range of weather available from late afternoon sun to hail storms. Many thanks to Ray Campbell (last man), Steve Graham (photographs) and the other Road Captains who came out to assist (Rob Warr, Fred Woolcott, Paul Wiggins). Penshurst Place, especially Wendy Warshawski, for making us welcome. Feedback on the C&F Facebook page indicates that people enjoyed themselves. The positive comments are very encouraging. Winner of bad luck award of the day went to Guy Ingram whose throttle cable snapped in the Tesco petrol station on the Kings Road. He pushed in to the rear yard at 611KR without incurring time penalties but was unable to continue. Second prize went to Keira who unfortunately had to drop out on her brand new and gorgeous sounding 1200 Custom due to an impending migraine. 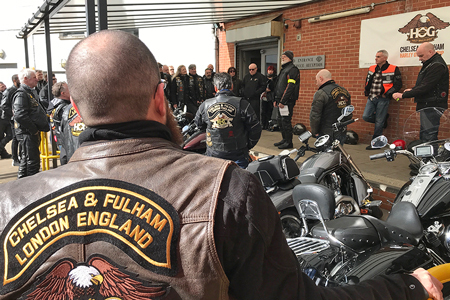 Next Rideout is Sunday 14th April, when your host will be Jonathan Gooch. Gates open at 09.15 and close at 09.45am. Please arrive quietly.